This is a really easy recipe and fantastic is you love crunch potatoes! Who doesn’t !? 🙂 Adapted from a recipe by Jamieanne whose recipes you can find on her blog Sweetest Kitchen. All I can say is it was great to see a potato salad recipe that didn’t have mayonnaise in it, yay! I loved the watercress and olives and thought they went really well together and set this salad off nicely. Don’t worry if you do not like the taste of olives they aren’t very strong in this salad. Next time I make it I am going to try sun-dried tomatoes instead of the olives for something different. Hope you all like it as much as I did. Cook your potatoes in a saucepan of water as you normally would. Drain them, cut them in half lengthways and let them cool. Combine all your other ingredients in a bowl, mix it all up and add some salt and pepper to taste. Preheat a frying pan, brush your potatoes with the oil and cook for a couple of minutes until they are a golden brown color. 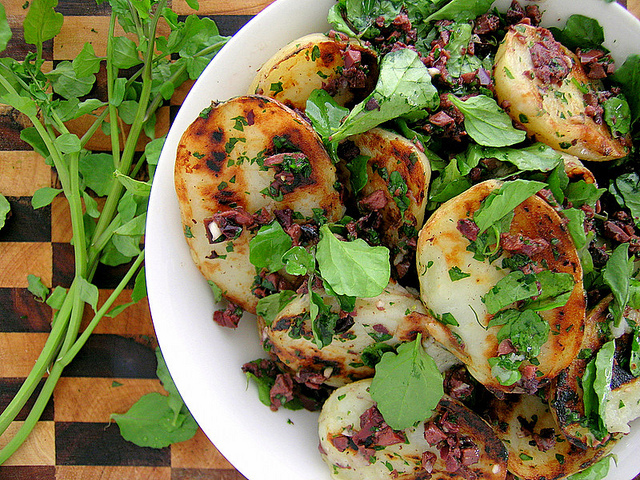 Add the cooked potatoes to your salad bowl and serve warm. We had some left over and let me assure you this salad is also very nice cold. Perfect for a healthy lunch.